Alain Delon as Tom Ripley in Plein Soleil (1960). A great film I watched recently. 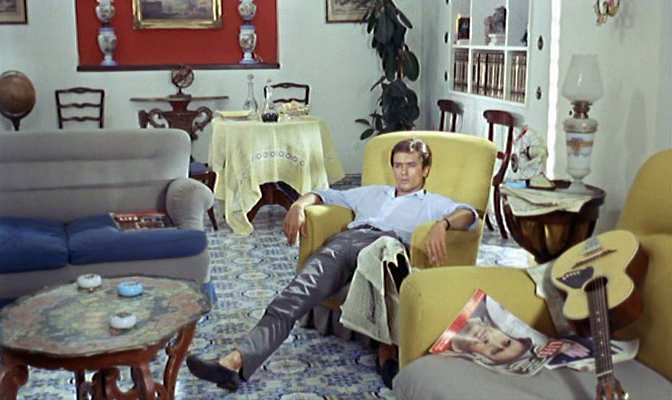 based on Patricia Highsmith's The Talented Mr. Ripley, and Delon's first starring role. Here he is most likely listening to 'The Only One' by Roy Orbison. I have spent the weekend listening and dancing to some great music on Friday and Saturday nights. Nothing quite like twirling around on an empty dance floor to a favourite song with a Red Stripe in your hand. People watch you and they can see, that for that moment, you are having a good time. These 12 songs are a collection of Florence staples and recent discoveries, a mixture of songs I own on record, ones sourced through various compilations I have inadvertently stumbled across, and recommendations from certain people who usually know what I like before I do. I seem to be naturally drawn to songs whose lyrics are of a more sombre nature, and these days, the more organ the better. Great songs to listen to in the evening while nursing a gin & tonic and reflecting upon life, or a soundtrack to accompany a spring clean on a Sunday morning. * I felt the need to give this collection of songs a cricketing title, having had just watched the West Indies' triumphant win over Sri Lanka at the Twenty20 World Cup. Titling things is hard, perhaps I should do the opposite to what I do with artworks, which are often named after songs, and name mixes after artworks. On that note, let's just add an 'untitled' in there for good measure.